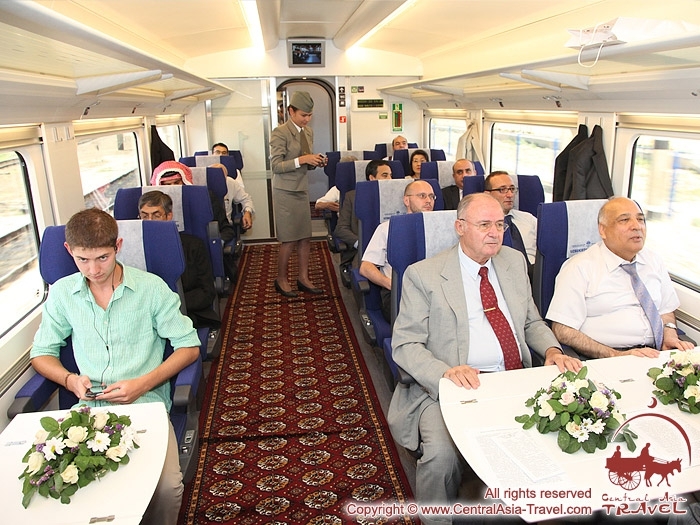 Rail passenger transportations in Uzbekistan are carried out by JSC "Uzjeldorpass" founded in 2002 as a part of State Joint Stock Railway Company "Uzbekistan Temir Yollari". 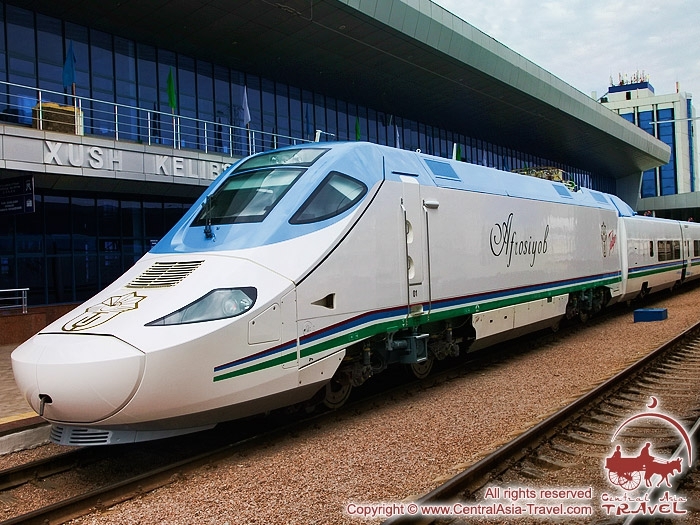 Between the main tourist cities of Uzbekistan, along with regular trains, comfortable speed trains "Afrosiab," "Shark" and "Nasar" run. 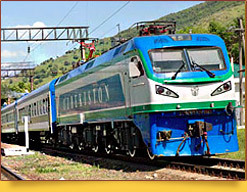 The total length of the railways in Uzbekistan is more than 6,020 km, including 4,230 km of public roads; about 15% of roads are electrified. 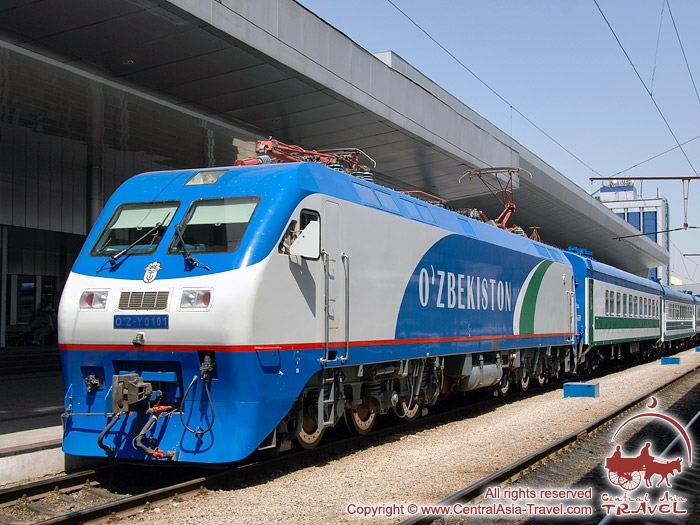 State Joint Stock Railway Company "Uzbekistan Temir Yollari" is the only industrial-economic complex in Uzbekistan, which provides rail services both for the population and for the national economy. 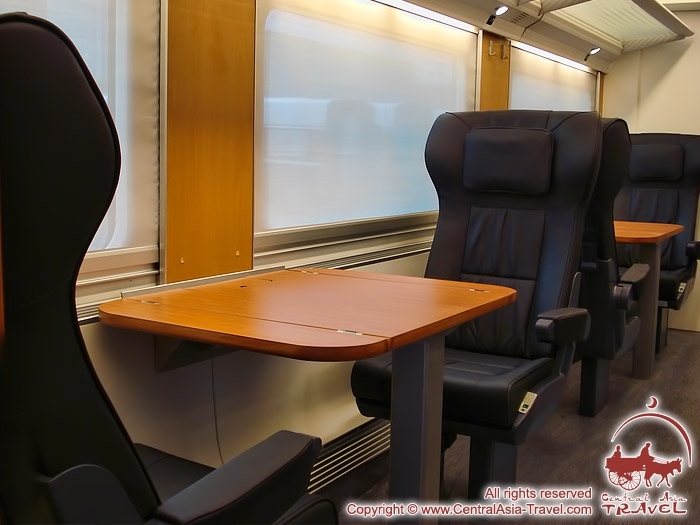 • High-speed deluxe train “Afrosiab”. • Night train no. 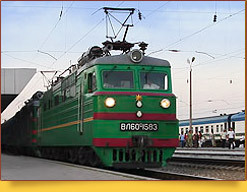 661/662 Tashkent-Bukhara-Tashkent. 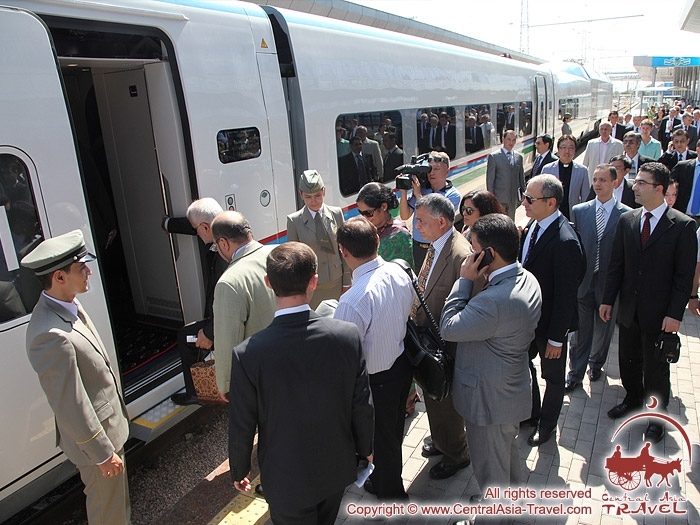 High-speed train "Afrasiab" runs daily between Tashkent, Samarkand and Bukhara. 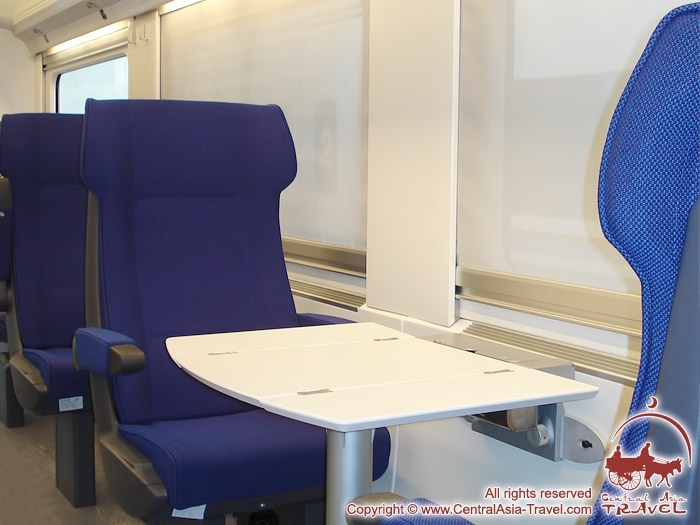 The train was developed using the most advanced technologies in Spain by specialists of “Talgo”. The aerodynamic front design of the train allows optimizing the action of wave pressure and crosswind, reaching maximum speed. 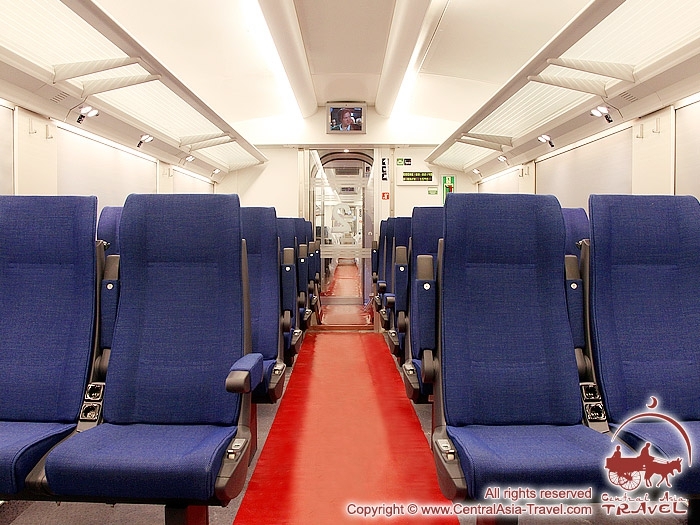 On the train, "Afrasiab", there are created optimal conditions for the comfort of passengers. 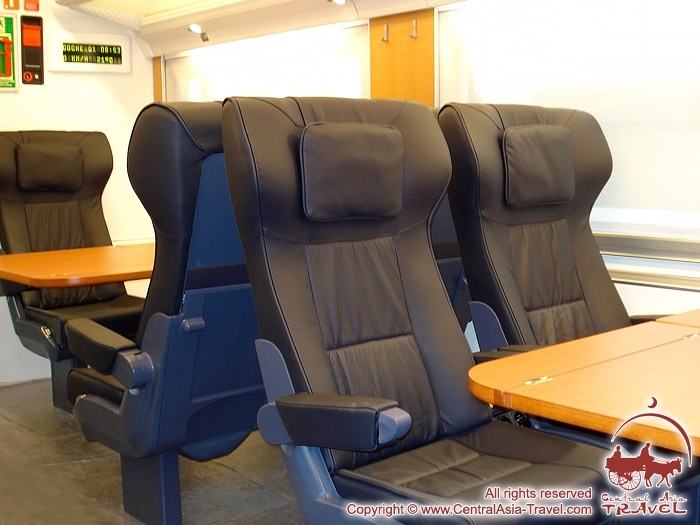 All seats are equipped with comfortable reclining chairs, table and footrest, built-in audio and video modules monitors for watching video and reading lights. 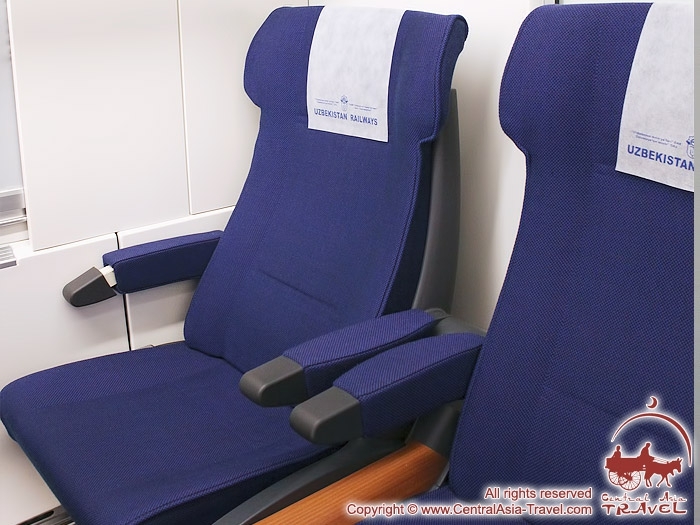 There are luggage racks and hangers for clothing above the seats. All zones are the non-smoking areas, all lounges have fitted carpet. Each coach has an information board that illustrates the information about the route, number of the coach, the interior temperature and current speed. 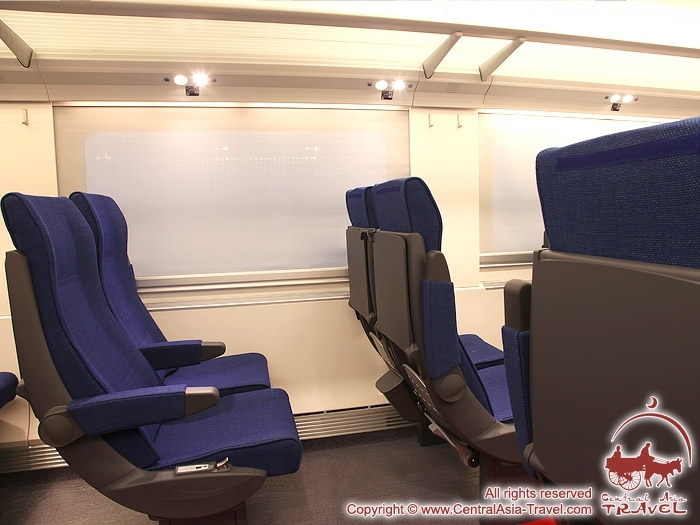 The windows in the train are equipped with sun shades made from a special laminated glass, which provides good sound insulation. Regardless of the season and temperature outside, comfortable climate is always maintained in the coaches. 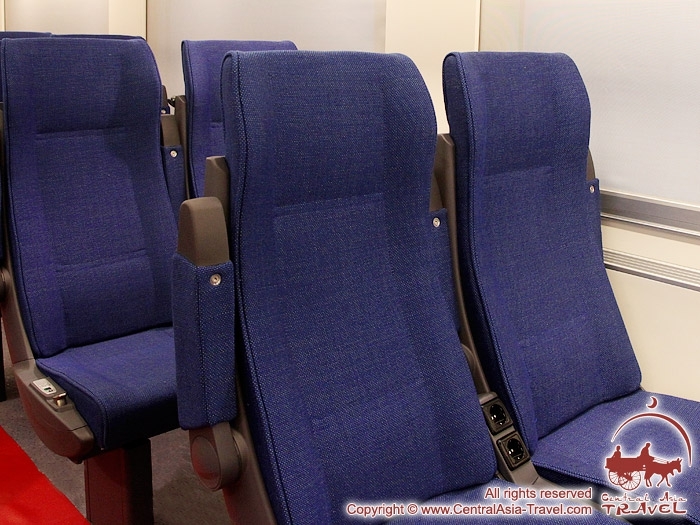 In high-speed train "Afrasiab" there are also conditions for disabled persons: the floors in all zones of the train are of the same level, and the third coach is equipped with special fasteners for wheelchairs and steward call button. Nearby there is a single-purpose toilet facility. 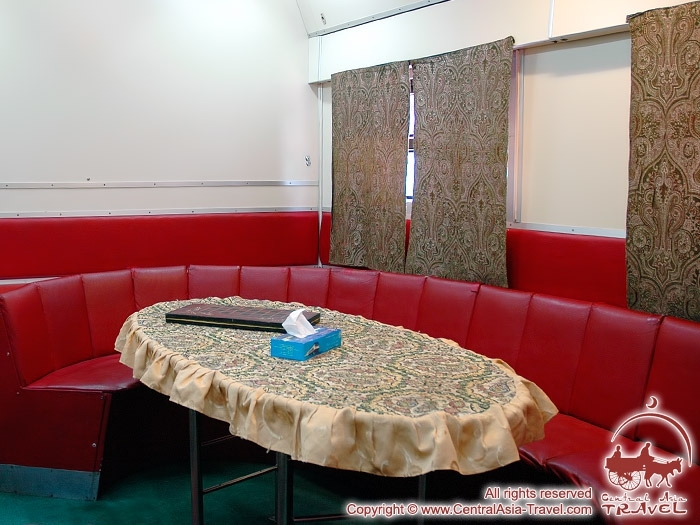 In the car, "Bistro", passengers can enjoy Oriental and European dishes as well as order soft drinks, tea or coffee. 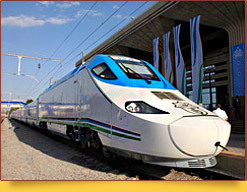 Engine drivers and the staff of the high-speed train were trained at the factory of "Talgo" and "RENFE" (Spain) companies. 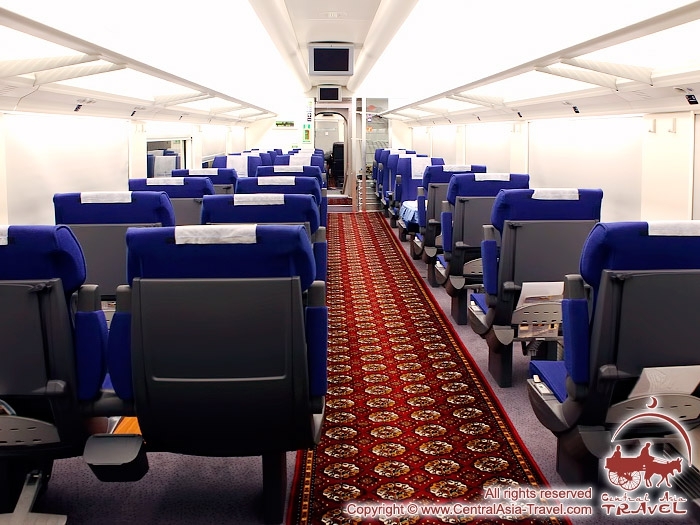 The train "Afrasiab" meets all safety standards: there was successfully carried out a full cycle of the preliminary, acceptance and certification tests of the train on the Uzbek railways. 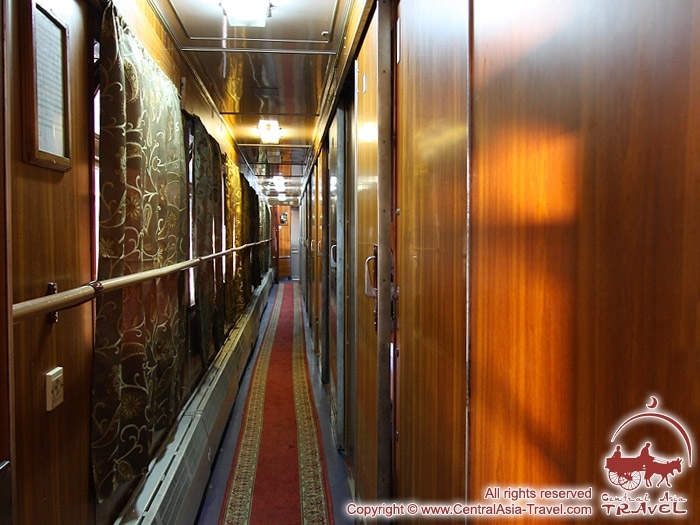 Deluxe Express train "Shark" is real "Orient Express" (‘Shark’ in translation from Uzbek means ‘East’). 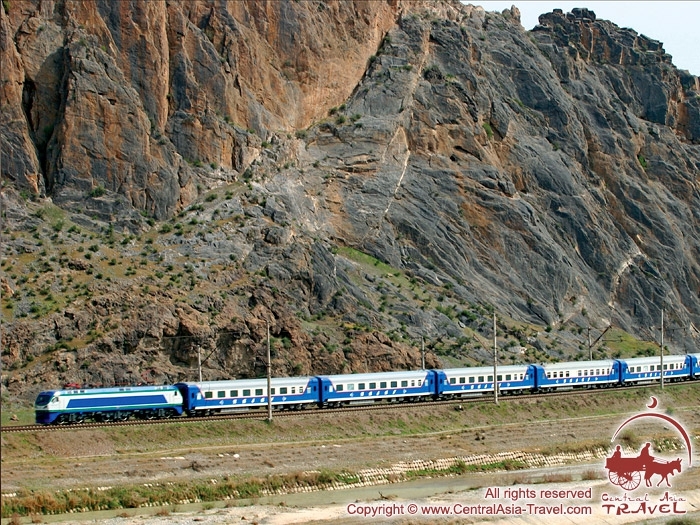 This express train connects three ancient cities Uzbekistan: Tashkent, Samarkand and Bukhara. 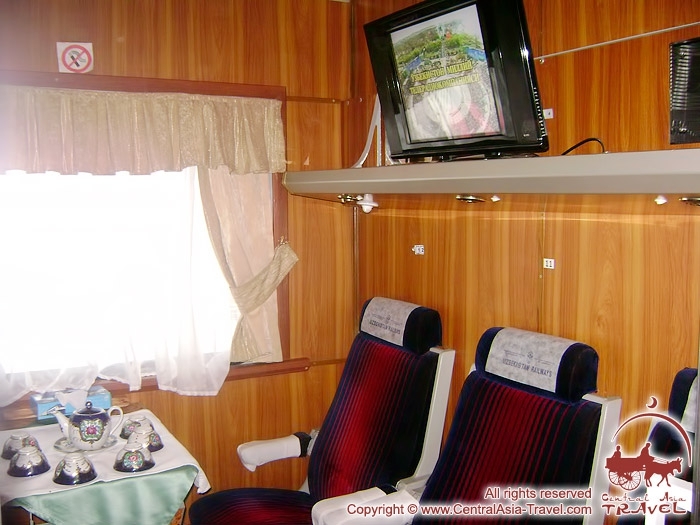 Reaching maximal speed of 160 km/h the train "Shark" quickly and comfortably covers the distance between the endpoints (Tashkent - Bukhara, 616 miles) in 6 hours and 40 minutes, which is 5 hours faster than if you were traveling on an ordinary train. En Route, "Shark" has a stopover for 20 minutes in Samarkand. 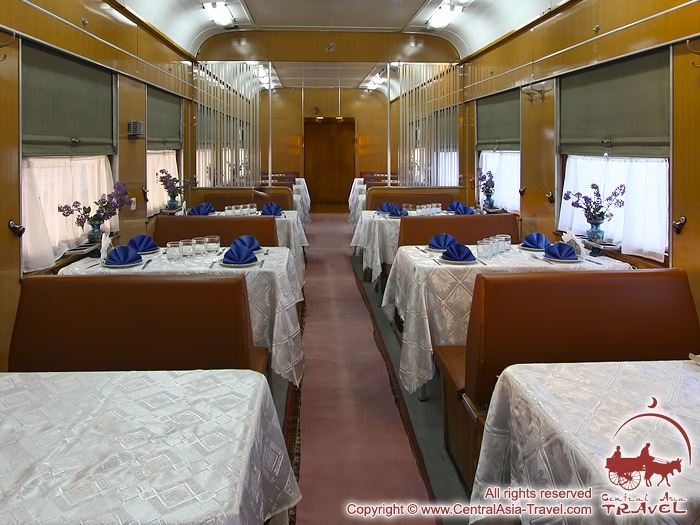 The train includes comfortable compartment cars, 1st and 2nd class cars, as well as a buffet car. 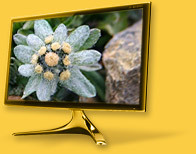 All cars are completely on a par with international standards and fully meet the requirements of the sanitary norms: they are ergonomic, with good insulation everywhere provided, and comfortable microclimate at any time of the year, and the most important thing- there is guaranteed absolute safety even at a maximum speed. Each car is equipped with TV, it is possible to watch movies and music videos, and you can listen to FM-radio or music, read the latest press. 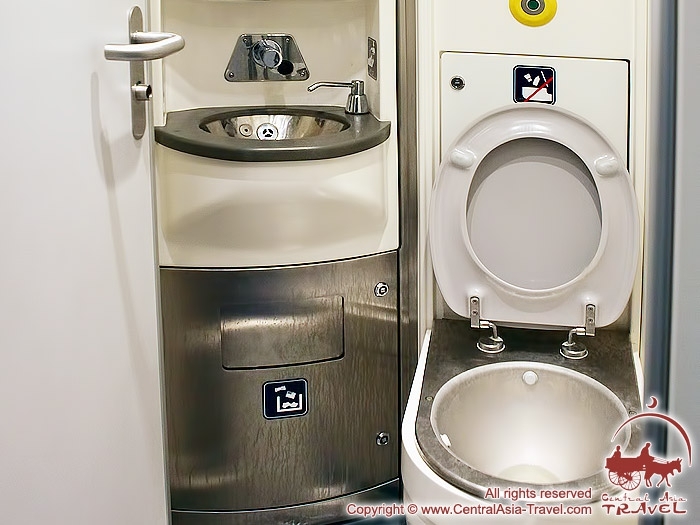 En Route passengers will be offered light breakfast (included in the fare), a wide range of beverages. Separately, you can buy souvenirs and order extra soft and alcoholic drinks. 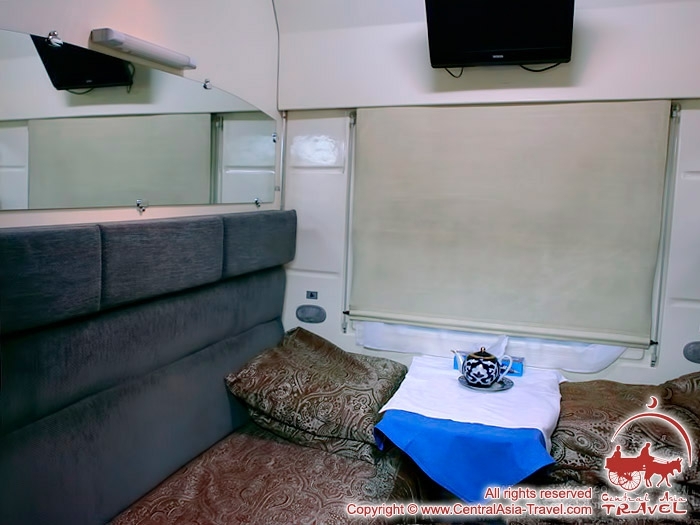 High speed, maximum comfort and excellent level of service - that's what attracts residents and visitors of Uzbekistan, who make their choice in favor of deluxe train "Shark". Stopovers: Gulistan, Djizak, Samarkand, Navoi. 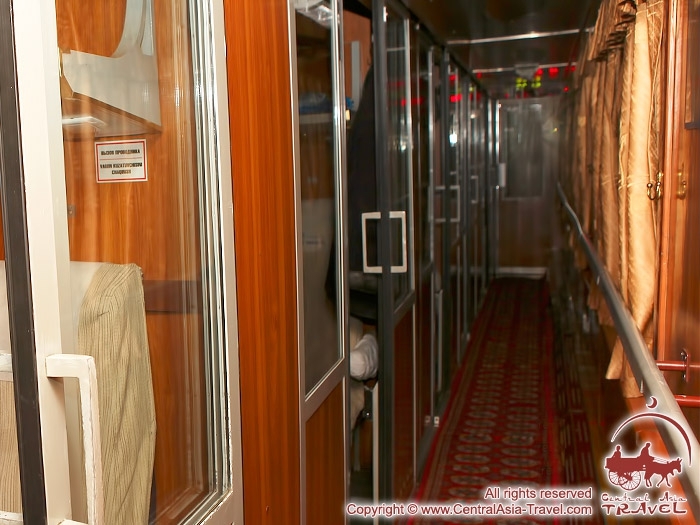 Night train Tashkent - Bukhara - Tashkent is very convenient for those on a city tour, as the train departs from Tashkent at 20:10, and at 6:00 next morning the passengers step onto the platform of the Bukhara railway station. 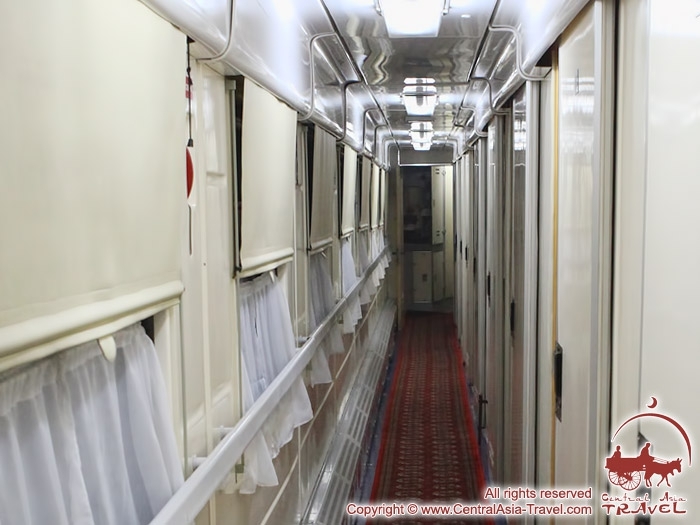 The carriages of the train are comfortable, which makes it possible for the passengers to sleep properly during the night. 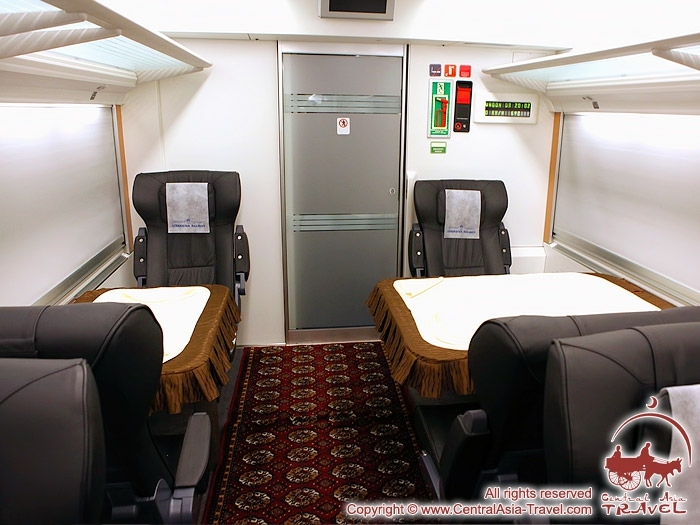 Thus, the tourists’ schedule is arranged in the best way, allowing them to sleep in the train at night and spend the day on sightseeing in Bukhara. Train No. 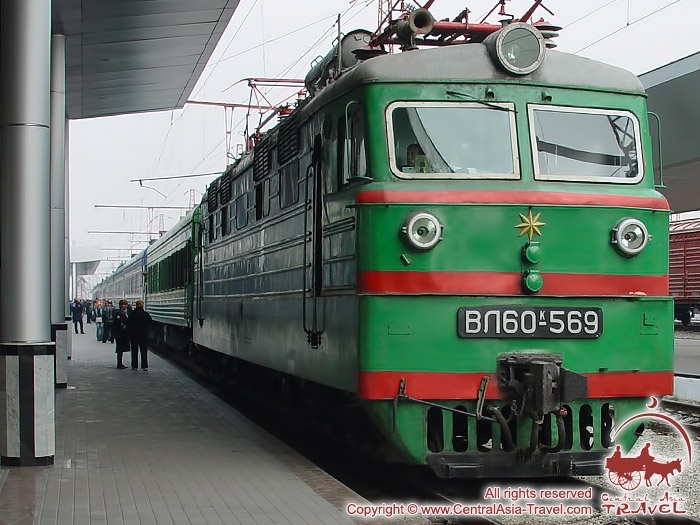 661/ 662 consists of 20-22 carriages (the quantity may vary) and runs between Tashkent and Bukhara every day. 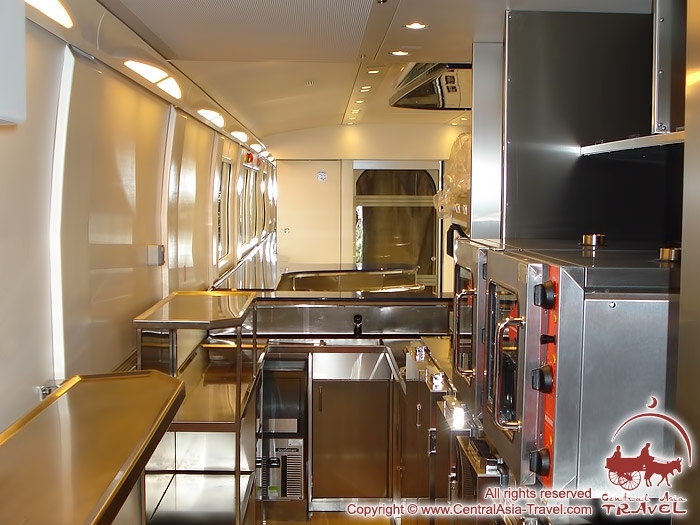 The train includes 5-6 carriages with double compartments with TV sets, and 1 restaurant car, where you can order soft drinks and dishes of the European or local kitchen. 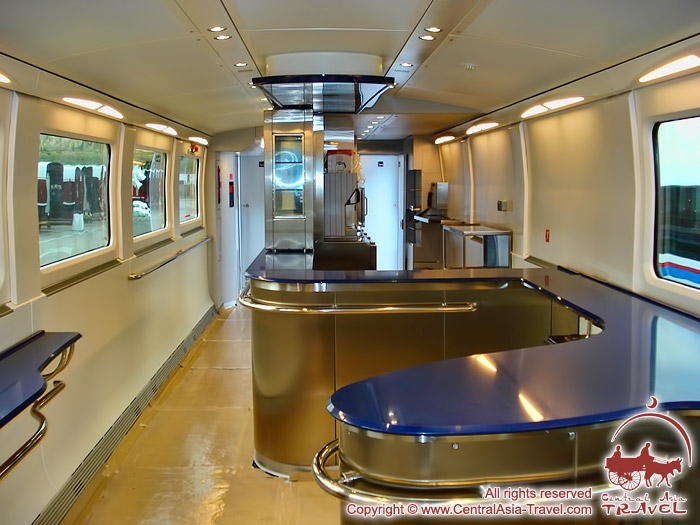 The train fully meets all international standards and safety requirements. 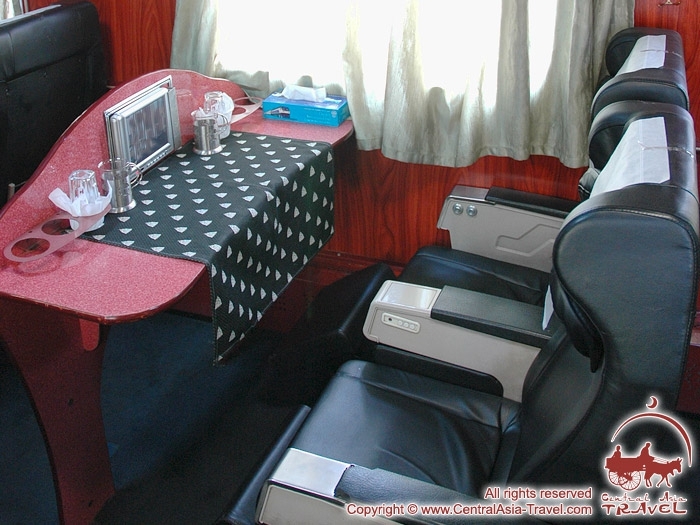 In the course of the travel the passengers are offered a breakfast, hot tea and soft drinks. Stops on the route: Gulistan, Jizzah, Samarkand, Navoi. 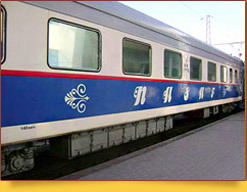 High-speed deluxe train "Nasaf" runs along the route Tashkent - Kitab - Tashkent since December, 2007. 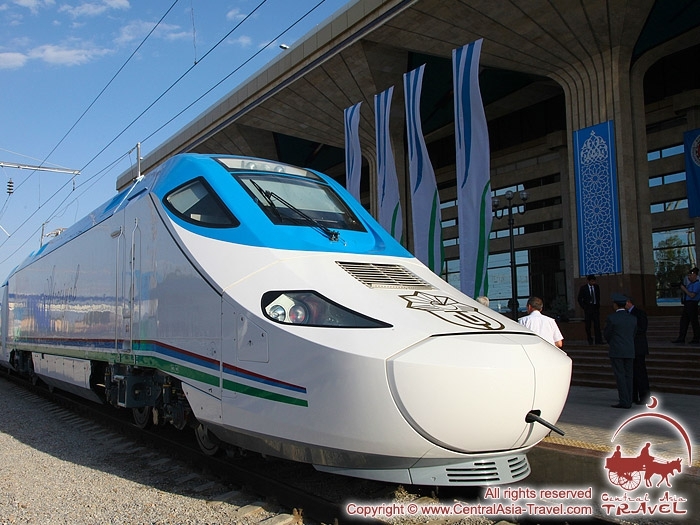 The train makes stopovers in Gulistan, Djizak and Samarkand, and covers the distance between the endpoints (Tashkent - Kitab, 622 km) in 6 hours 47 minutes. 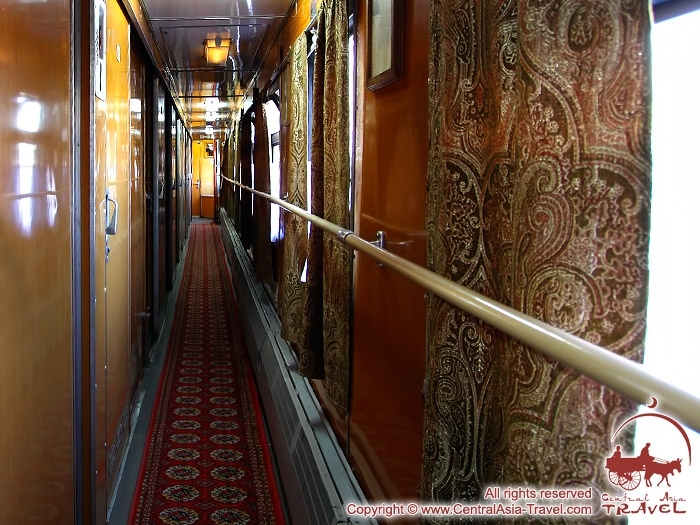 Deluxe train "Nasaf" consists of 7 comfortable cars: compartment car, 1st and 2nd class as well as buffet car. All cars are equipped with comfortable soft seats and are completely on a par with all national and international quality standards. 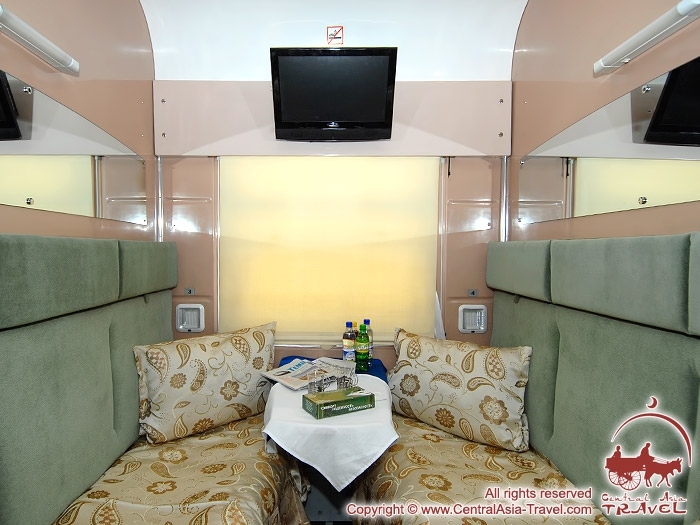 The coaches are equipped with TV (you can watch video films and music video), and it is possible to listen to FM-radio or music. 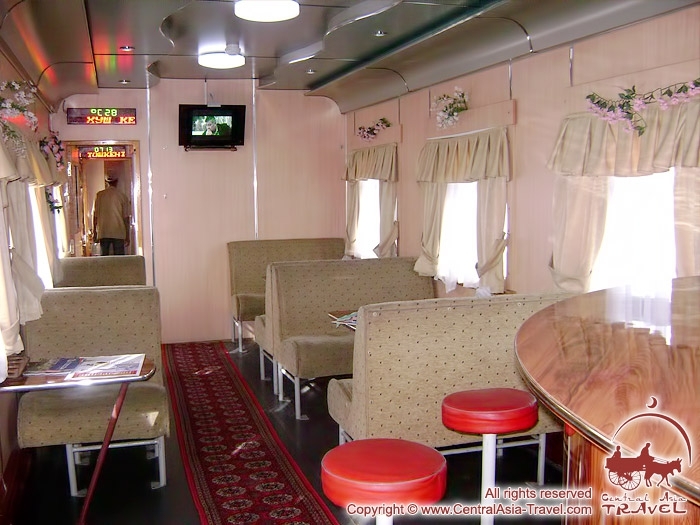 The train “Nasaf” runs 6 times a week, and can serve 252 passengers. 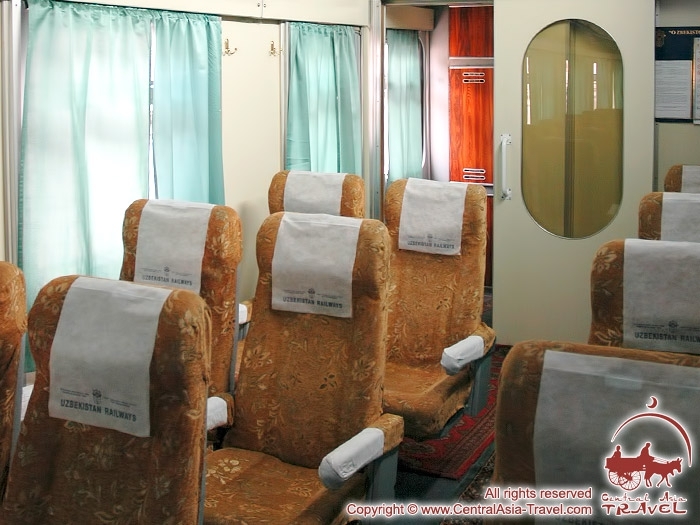 During the travel the passengers will be offered breakfast, hot tea, and soft drinks. 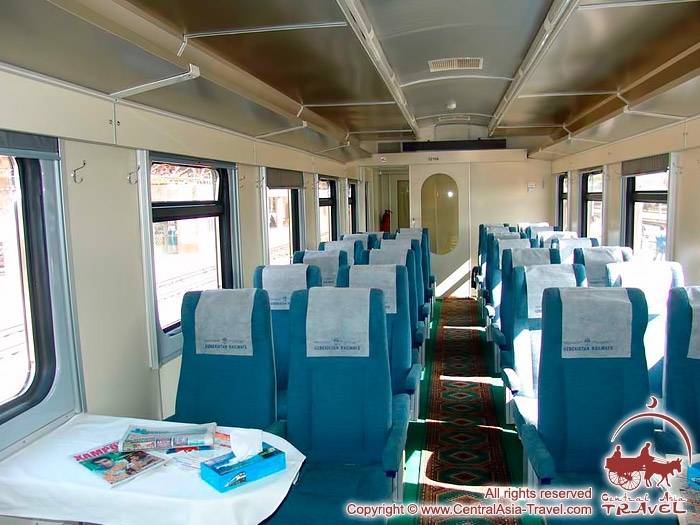 A new touristic train “Afsona” was put into use on April 11, 2013, it will connect Southern regions of the Republic with Northern ones: the train goes according to the route “Tashkent - Karshi - Urgench”. 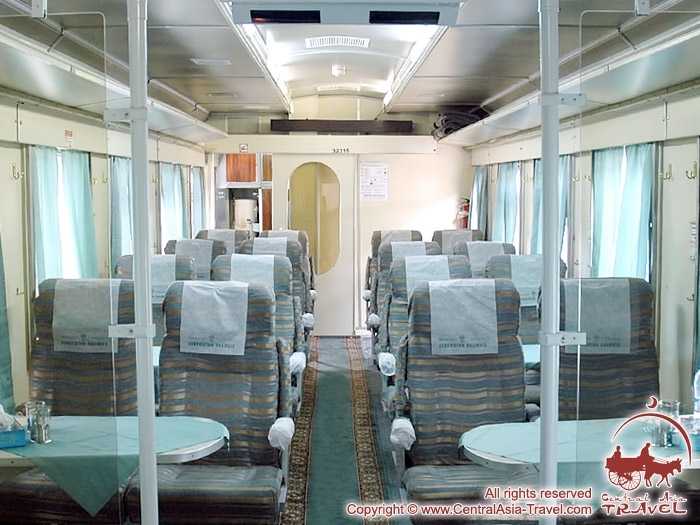 Special train “Afsona” will give a new incitement to the tourism development in the most ancient region of Uzbekistan - Chorasmian, it will help to promote the popularization of inner tourism and railway tours in the Republic. Now it is possible to get to Khorezm from Karshi, Bukhara, Samarkand and Tashkent much more comfortably, easier and faster. 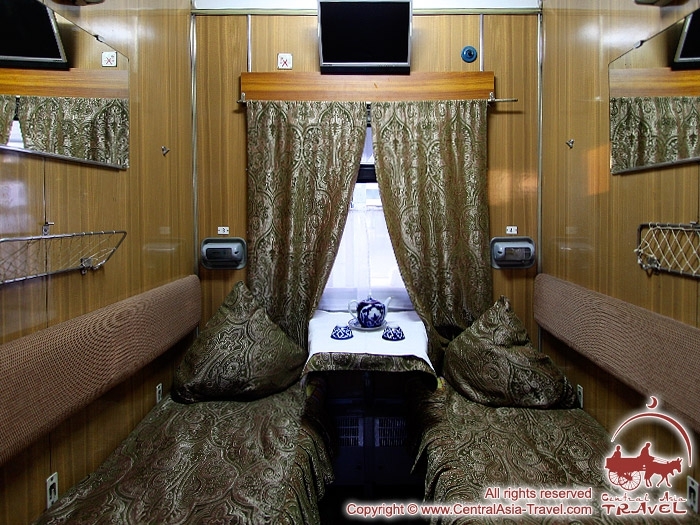 New touristic train “Afsona” (the name translates as “Legend”) consists of 8 comfortable coaches: there are coaches of luxury class, compartments, and dining car. 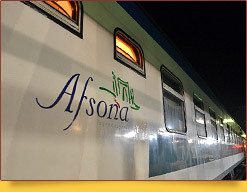 Charter train of enhanced comfort “Afsona” runs not regularly, but according to the individual request. The route, stopovers and cost of tickets depend on pre-agreed individual tour program. 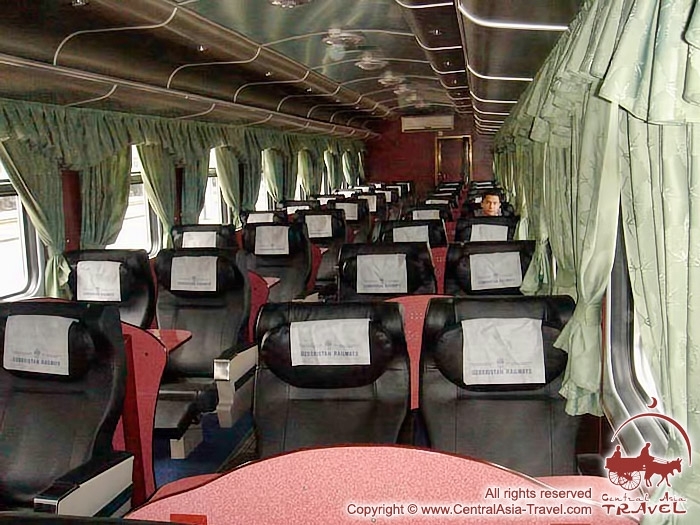 For organization of a charter train it is necessary to gather a group in 200-250 passangers. 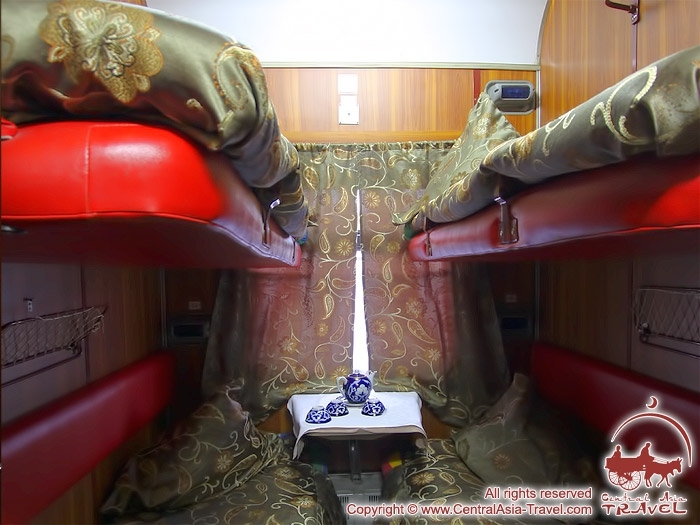 “Afsona” is a perfect option for large groups and corporative clients travelling about Uzbekistan. Stopovers: depending on pre-agreed route it can be cities: Tashkent, Karshi, Boysun, Bukhara, Urgench, Navoi, Nukus.